Nobody calls it as they see it quite like Dana White. To kick start the UFC’s new 115-pound women’s division, Invicta Fighting Championships ended up signing over 11 fighters under contract so they would be able to start a new career inside the Octagon starting with The Ultimate Fighter 20 in May. 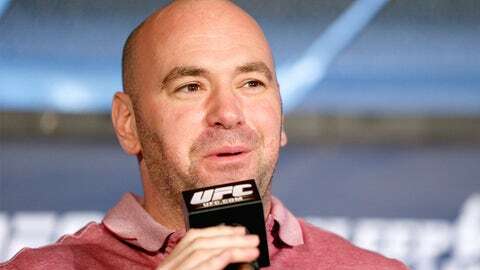 It was a bold move from the UFC to raid an entire division from another promotion, but Dana White and other executives have had long standing ties with Invicta president Shannon Knapp over the years. The relationship has yielded several top fighters that have moved from Invicta to the UFC, and this is only the beginning as the 115-pound weight class begins to flourish in the next 12 months. White said that the negotiations to bring the women over to the UFC started about a month ago, but he knew all along that Knapp would rebuild the division in Invicta and those fighters could also one day compete in the Octagon as well. The girls who go into Invicta can now look and say ‘Jesus, we’re going to fight in the UFC some day. "I took the 115 pound division, she will build another 115-pound division," White said. "The girls who go into Invicta can now look and say ‘Jesus, we’re going to fight in the UFC some day." It’s not easy for any promotion to hear that they are being set up as a feeder system to the UFC, but White put it bluntly on Thursday when he shared a harsh truth with every promotion on the planet that’s doing business in the MMA arena. "As bad as people don’t want to believe it, they don’t want to hear it, meaning the other owners of the other mixed martial arts organizations – that’s what they all are, they’re all the Triple-A to the UFC," White said. "All the people who fight it end up $30 million in the hole. All the people that don’t embrace it, embrace losing sh-t loads of money. You can either embrace it or burn cash, either way you want to do it." The UFC has worked with several promotions lately bringing talent into the Octagon, most notably Resurrection Fighting Alliance (RFA) – an organization headed up by noted MMA manager Ed Soares. Over the last few months the RFA has placed several of their top fighters into the UFC including Brandon Thatch and UFC on FOX 9 replacement Zack Makovsky. White believes that promotions working with the UFC as opposed to against them is the only real way to succeed in the MMA business. Plenty of others have tried to go it alone, and there’s a graveyard of failed MMA organizations to prove it rarely works. From Affliction to Elite XC to the IFL – the list is long of promotions that tried to go head to head with the UFC, but there’s not many left standing these days. "You have to run your business like a business," White said. "These guys that pop out, they’re a small business. Bellator’s owned by Viacom, they’re a very small business and you either run it like a business or you go out of business. And what’s even crazier is they don’t learn from the past. "They don’t look at all these people who crashed and burned and learn from it. They just continue to crash and burn."